Measurements: 3.9 cm H x 0.5 cm Thick x 5.5 cm DiameterHeight as highest point of broken side. Thickness is of base. Diameter at intact edge to intact edge. 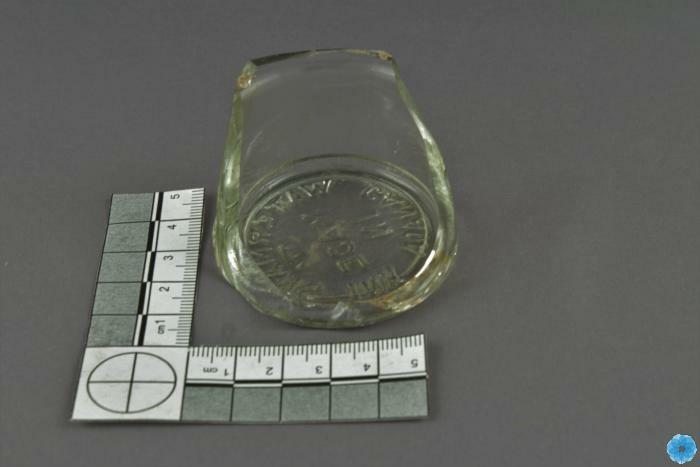 Description: Medium sized, clear, broken bottle with small part of a side and intact base only. This is an ink bottle as shown by the labelling on the bottom that was produced in Canada. History of Use: Waterman company was founded in the US but built a large factory at St. Lambert PQ in 1906 to supply the Canadian market.